A taste of Mexico and the Caribbean! 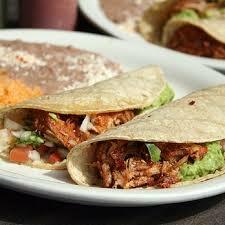 Our restaurant is a family business that serves fresh and healthy Mexican and Caribbean foods. We are proud to have Chef Elias creating his magic in our kitchen. Our tamales, chile rellenos, sauces, dips, marinades, beans & rice are all made from scratch daily. We use no lard or MSG in any recipe. Next time you’re in introduce yourself! We’d love to get to know you! We feature over 100 brands of tequila and invite you to sample most of them in our Flight of Tequila that includes three 1-1/2-oz. shots (select tequilas priced separately). Don't forget to ask how you can join our Tequila Club! With craft beers, wine, a full liquor menu, handcrafted margaritas and specialty cocktails, we have something for everyone to enjoy! SIT BACK RELAX AND LET US DO THE WORK AT YOUR NEXT PARTY! The same food you love at the restaurant, brought to you! Enjoy extra time with your guests, as our friendly uniformed staff provides a delicious buffet for your party.